Dog Tags aren’t just for dogs anymore! Dog tags have been showing up everywhere these days. Yes, they are a great way to identify you beloved Fido but now they are so much more. Dog tags can be used to show support for a cause, given out as event souvenirs or memorabilia, given out as participant awards and affordable alternatives to custom award medals or just given out for fun. Recipients love to hang them from book bags, in their school or gym lockers, on their key chains, from their mirrors and just about anywhere they can show them off. 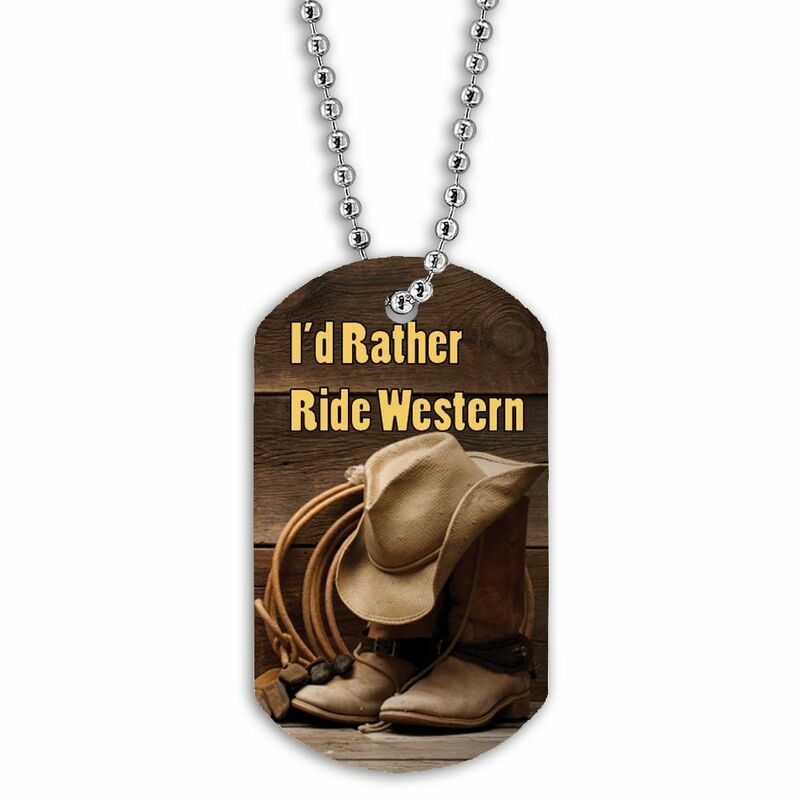 With all of the possibilities in mind our talented art department has been hard at work over the past year or so creating designs for dog tags that everyone is sure to love not matter what your need. The engraved or printed text can be whatever message or information you want to give out but is limited to 4 lines of 15 characters including spaces to provide the best look and size of letters. 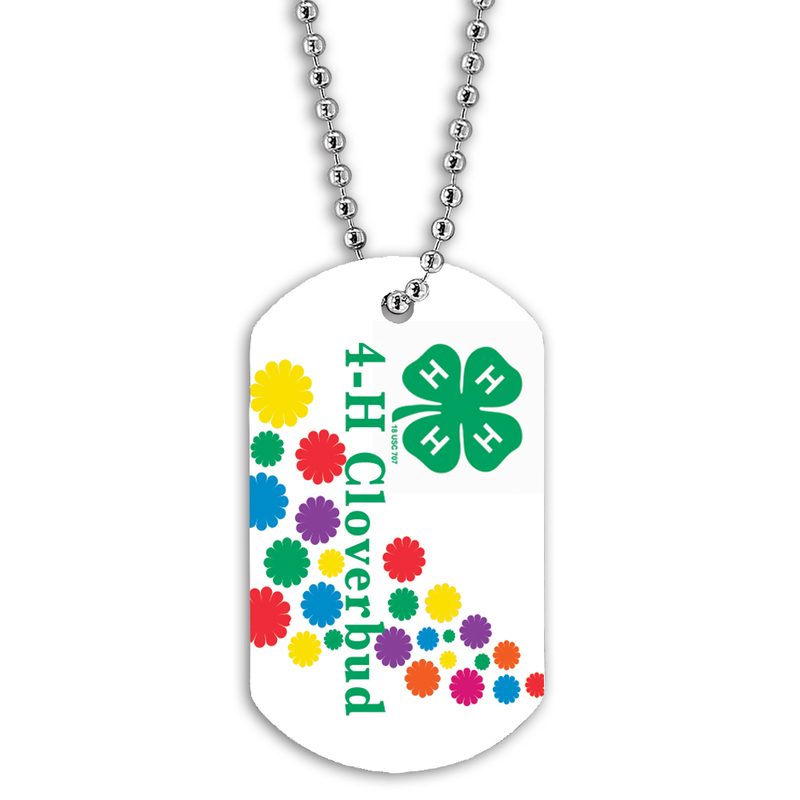 Don’t see the design you want on our dog tag stock design page (100 + designs)? Design your own! 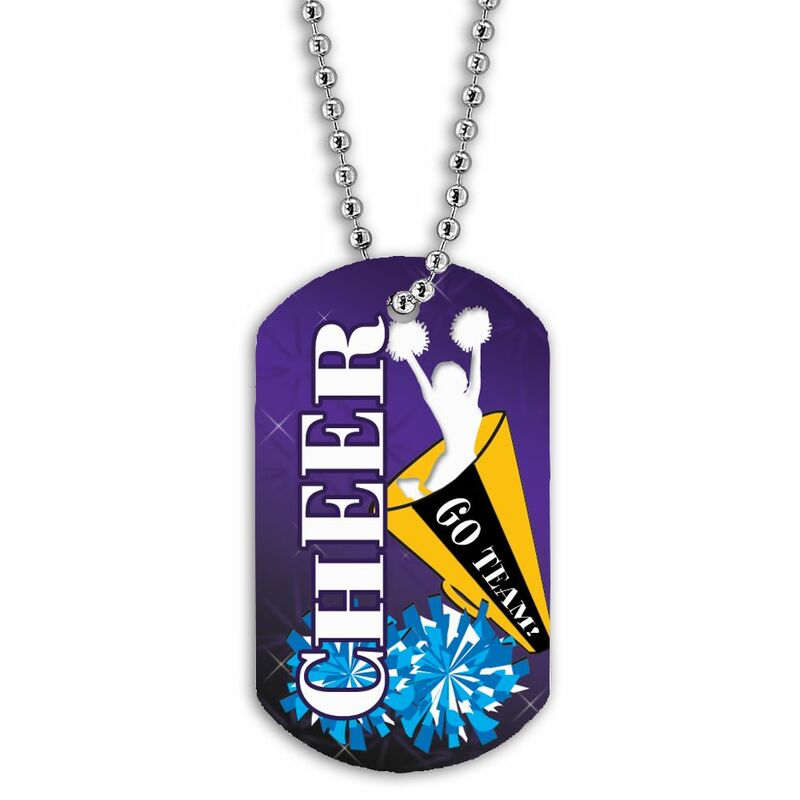 Simply work with a customer service representative and send us your artwork, whether it is a logo, a student’s designs or a club/team mascot and we will apply it to the dog tag. The sky is the limit. Each catalog we strive to find new solutions for your awards. 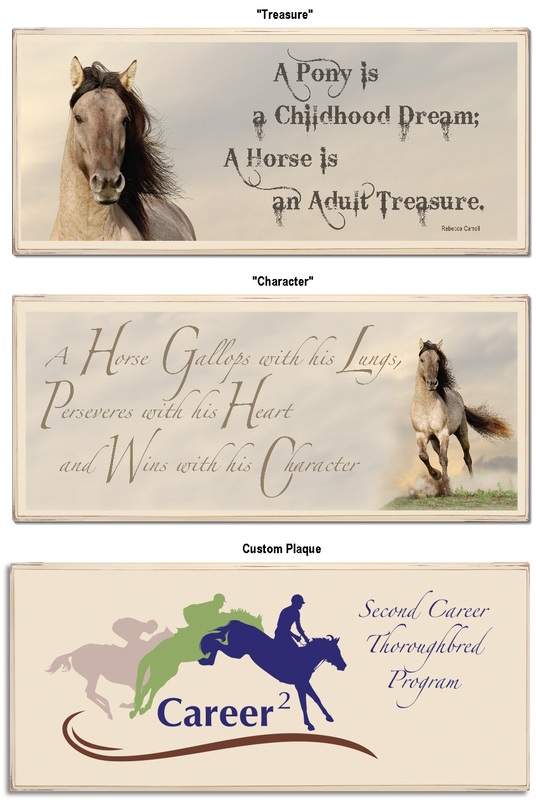 We just published our Equestrian catalog (in January) with over 35 new products. I wanted to tell you today about my personal favorite new equestrian awards in the new catalog. My first favorite is our new vintage equestrian plaque. We actually have three versions. Two, the “Treasure” and the “Character” are sold as is with no customization but offer inspirational messages with beautiful imagery. The third version is the custom version of the vintage plaque. This version allows you to put any type of artwork, photograph, logo, design, text, event information or names on the plaque while still keeping the vintage look. My second favorite product is the new Windsor Rosette. 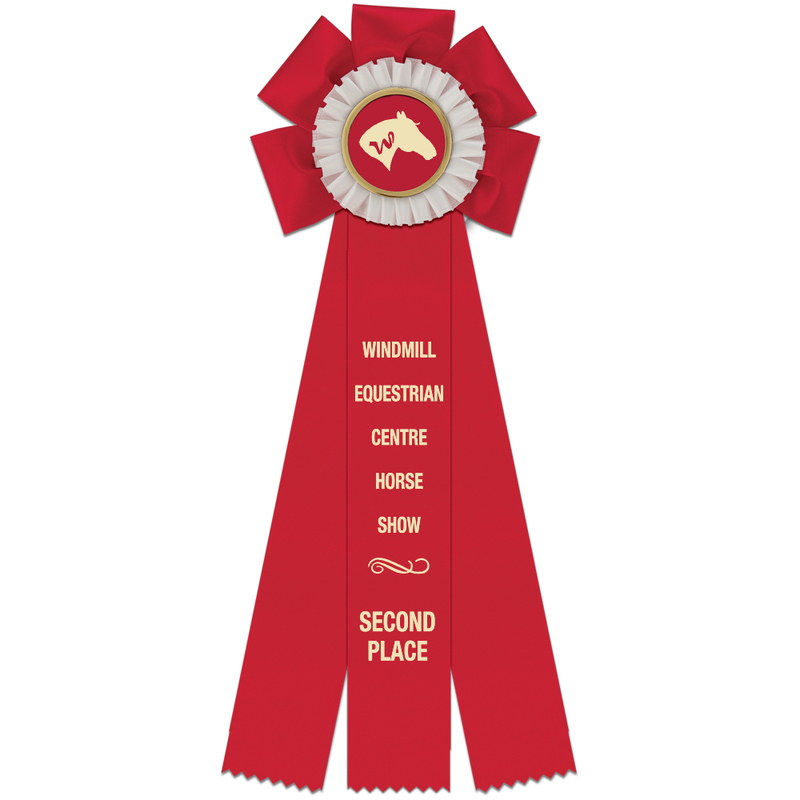 It offers something a little different from what is currently in our extensive line of equestrian rosettes. The Windsor Rosette features a ¾ rosette top made of hand sewn petals and three 12” streamers. Just like our other rosettes, you can still choose a button, gold rim, or satin center rosette center with your logo or a stock design, any ribbon color or combination of ribbon colors including exclusive multicolor side streamers and 10 lines of custom print. The Windsor Rosette can also be customized with up to 24” streamers to accommodate if you are looking for a larger rosette. My third favorite product (which by the way I am definitely suggesting to be given as employee appreciation gifts at Hodges) is the Rosewood Pen & Pencil Set. 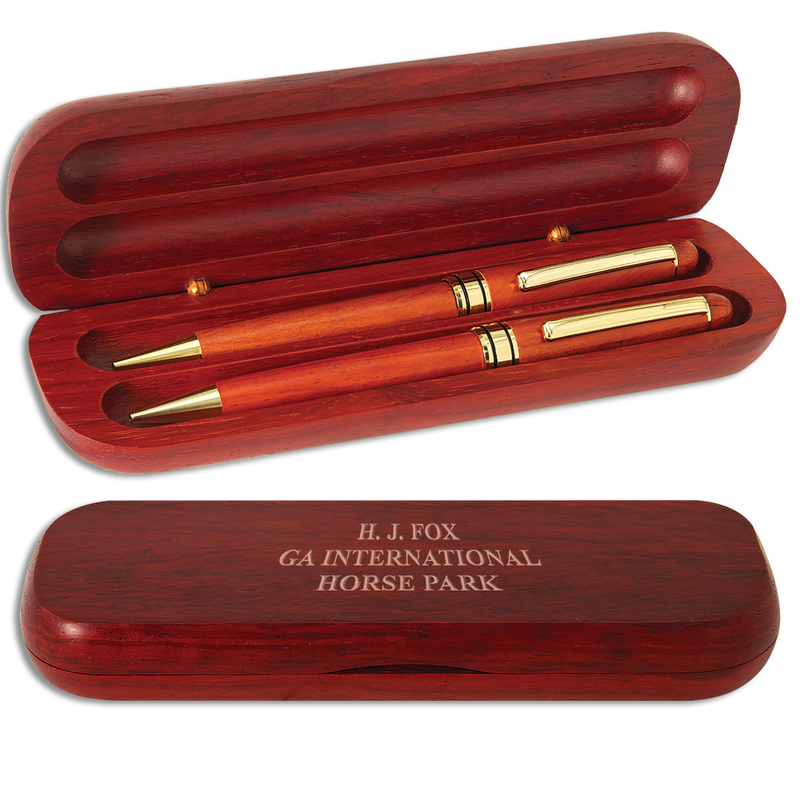 This set can be engraved with you logo or event information on the case. I know it is the age of tablets and smart phones but who doesn’t need a good pen & pencil set. So I’ve listed my personal favorites here but we have so many more new great products in this catalog. Go on-line, find your and let us know. We would love to get your feedback. Happy browsing!